Can we just express our deepest thanks to Kirsty, Johnny & George for their support! Their JustGiving link is at the bottom. George spent 4 weeks in the Royal Victoria fighting hard; eventually we got home beginning of March…. Eventually we were referred back to The Royal Hospital for Sick Children, that’s when things changed, the picture became a little clearer , Doctors started listening and taking action. We started getting some answers! Days turned to weeks, which turned to months, we were travelling up and down the 120 mile round trip each day, it was emotionally and financially draining on family life! That’s were Helping Hands came in to help us, they temporarily funded accommodation closer to Belfast for the summer months to ease our commute which really take some of the pressure off, we would like to be able to give something back!.. During our stay at the Royal we couldn’t have been better looked after! The Staff at Paul Ward were just amazing!! From the Doctors and Nurses to Domestics; to Play Therapists ; every single one of them made our stay as comfortable as it could be given the circumstances, we can’t thank them enough. So we want to raise some funds for the ward to provide some much needed equipment! I have decided to organise a Sponsored Walk on Sunday 16th September At Cuilcagh Boardwalk ‘Stairway to Heaven’ in Fermanagh. There are still a few spaces left on the designated bus if anyone is interested in joining in? ..
As many of you may know the outlook for our wee George isn’t so good, even though his condition is undiagnosed, we have been told that it is Life Limiting and unlikely to make his 1st Birthday, his epilepsy is so serious that he isn’t responding to treatment. There isn’t much more hospital can do for us so we are now at the NI children’s Hospice and we really don’t know how long we have left with our little guy. 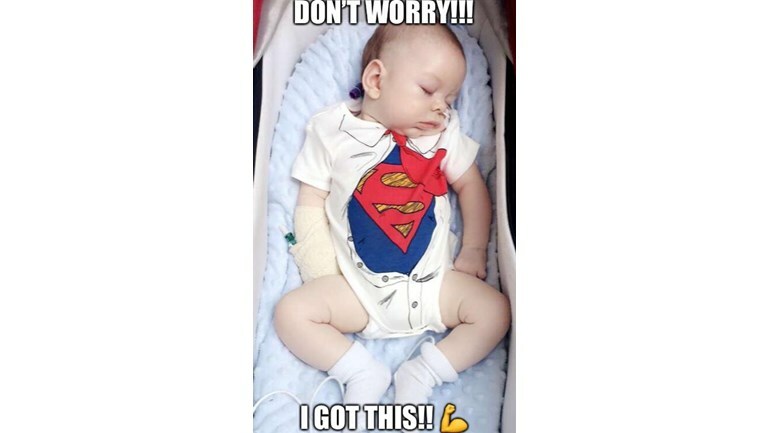 But we are living for each day making wonderful memories along the way… He’s a wee fighter!